I am the lady in question. I am not actually an online person per say; but I happen to be one of the avid readers of Ladun's Forums. I am really very surprised at what I saw. This man called me and told me he owns a foundation and he will love to help and I really appreciated his effort. He asked me where my husband currently works and I told him. He said 'wow, so he really has such experience and he hasn't been converted yet. He then asked how much are we looking at; I told him he has over 11 years experience as an I.T engineer so We will be looking for something higher that can take care of d family this time; like 6 digits. Continue..
"owing him salaries for months" I never said this to you sir. 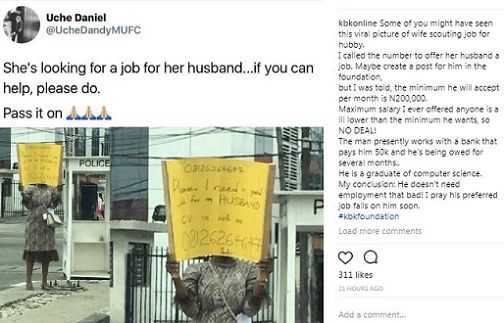 Now, because i said 6 digits salary this person is now broadcasting it over social media in an attempt to make us look bad and possibly make it difficult for the us to get a 'real job' that we are seeking for. Sincerely....Any graduate in our shoes, would have said exactly what i said. Is there not a Yoruba proverb that goes- "If you want to eat a toad, you eat the one full of eggs"? I personally do not see any wrong in my sincerity. I became totally amazed to have seen our response painted in black on social media. Mr.KBK I sincerely do not know you but our God knows you . The awareness I did was not my thought or my idea but God's instructions. I feel that every promotion needs sacrifice and I sacrificed my ego to put this to work so as to bring God's promise for my marriage to reality. Mind you, Our Divine helpers are thirsty to help us. And people that have heard the voice of our God to help us are doing that. I'd continue to do this if it means well for our future. We will not beg or settle for less as thought and we will be happy eventually.God is on our side d he will put smiles on our faces. The voice that parted the Red Sea and brought water out of the rock will open doors of unimaginable blessings for my husband and my my marriage ijn. You will be alive to celebrate with us IJN. I put you in d spot light of the most High God. God bless you sir..
» BULKSMS APPLICATION SITE FOR SALE AT A CHEAP AND AFFORDABLE PRICE.